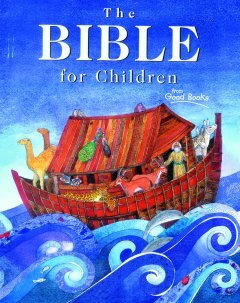 How about children’s picture Bibles? afford them, and read them together. for anyone that loves his other good work like Strega Nona or St.
size is nearly 9 x 9 and the explication of each passage is more than adequate. It has a ribbon marker, too. trust the tone and reading and vocabulary and realistic, traditional art. chapter reference for each story. really very, very artful and wonderfully attractive. be our true favorite; wish we could show you samples of the page spreads. The language is descriptive and artful, yet very clear. 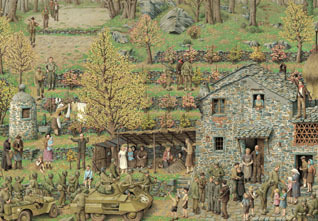 readers/listeners remember the events or characters of the preceding story. Contains an index of people and places in the back. Great! A joy to behold. SEE BELOW FOR A FANTASTIC 50% OFF SPECIAL OFFER. 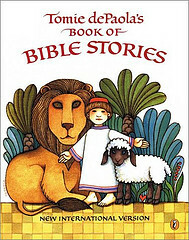 just a nice edition of the real Bible for younger children. This Young Discoverer’s edition, with some pictures, nice type face is also available in the NIV. the insights of the passages to daily living. They’ve got a variety of covers, some devotional books, too, even audio stuff in their “adventure” line. Go here for the full listing. blue stars) make this really nice. contemporary Russian styles with those of the Renaissance. little moralistic, but it is for really young children, so we think it is great. CD of the song. Love it. is one of his best. The illustrator is from Madrid, Spain. Great! 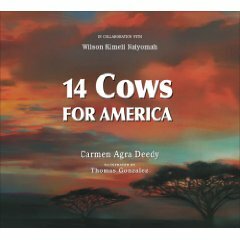 this a great book to teach about these themes. Nice! some Maasai tribesman in rural Kenya about this tragedy in the United State. book is wonderful and we highly, highly recommend it. front? It’s an Andy Warhol. work in His Kingdom can be seen in these fantastical tales. paperbacks with truly awful artwork that made the stories look terribly cheap. you have or haven’t yet read. experience and a very useful resource for educators. regularly priced at $23.95, while supplies last, only $12.95. Wow! What a fabulous list! I don’t have any children in my life now, but I will bookmark this list and come back to it later. I will add that the NIrV is a great translation for ESOL (English as a Second or Other Language) learners, especially if you can find it as a gift Bible (and not one obviously geared toward children). Highly recommended for international students! Thanks for the list! I love the updated version of Big Thoughts for Little People. 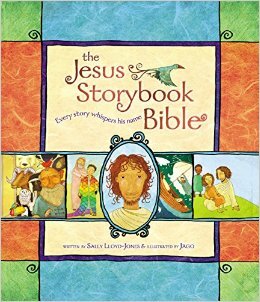 We loved two Bible storybooks that you didn’t mention–The Read and Share Bible and the Jesus Book. Have you read them? What did you think of them? It is a bit tricky to say as the “reading aloud to” age and the age with which a child can read herself is different. This has fairly basic sentences, but some vocabulary words that are more complex and descriptive (“angrily” “terrified” and such.). They use the big words of the names of other nations and characters in the O.T. (Midieonites, Xerxes, etc.) and it doesn’t shy away from complex stories. We seem to think it is suitable for older elementary ages although the color is bright and vibrant so little kids would enjoy looking through it. Yet, the art is mature enough that it isn’t “baby-ish” and wouldn’t embarrass a middle schooler. It’s pretty classy, we think making it useful for older kids. Still the reading level is for middle or older elementary grades (not pre-school.) There are well over 200 stories, and although not comprehensive (of course) it really does cover a lot of ground. We think it is one of the best.